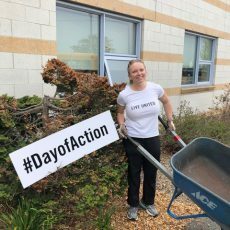 At last year’s Day of Action, members of Women United volunteered at East End Community School to cleanup the school grounds and school gardens. 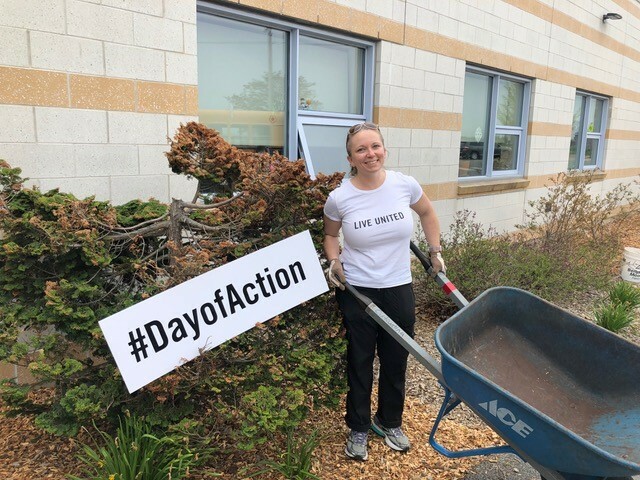 The project and location were well aligned for Women United, an individual giving group of United Way of Greater Portland focused on family strategies to advance opportunities for health, financial stability, and education for single mothers and their children. Through philanthropy, volunteerism, and advocacy, Women United is leading critical work that will positively influence single mothers’ ability to meet basic needs, give their kids a stronger start, and live longer, better lives in East Bayside. 52.7% of East Bayside families receive Supplemental Nutrition Assistance Program (SNAP). $31,386 is the East Bayside medium income compared to $61,902 in Cumberland County. 42.3% of East Bayside residents are living below the poverty line compared to 7.4% in Cumberland County. East End Elementary works with Cultivating Community and Food Corps that lead the students in hands-on garden/outdoor education activities. The project at East End Community School connects to Thrive2027 Goal 1, expanding access to high quality nutritious foods as well as increasing the quality of children’s early learning experiences by providing a variety of learning experiences. Students are also able to enjoy their very own vegetables including radishes, carrots, potatoes, kale, and more.